Task organization is challenging for many business owners, especially when there are papers, checklists, forms, and notes associated with your tasks. But I’ve found an office organization system that helps me manage my tasks, stay more organized, and improve my time management and productivity. Sound too good to be true? It’s not! Don’t miss these tips and ideas on how to organize tasks and learn how to get organized with a tickler file system! I’ve mentioned the Tickler File several times before today, first in Organize Your Home Office in 8 Steps, and then again in 8 Tips for Staying Sane When Working at Home. It’s one of my favorite tools for managing tasks, time, and keeping my desk and home office organized. And it’s easy to set up and requires only a few supplies. Let’s learn how to get organized with a tickler file! A Tickler File is a series of files used cyclically to sort, organize, store, and manage future tasks and activities. Anything that you need to be reminded of at a future date can go into your Tickler File. This system helps to centralize tasks and their associated paperwork. It also gets those teetering “to get done” piles off your desk. A Tickler File is made up of 43 files and a drawer or box to hold the files. Twelve of the files are labeled with the months of the year and the remaining files are labeled 1-31. Your Tickler File can help you manage your workflow by acting as an internal mail system. It will hold all of the items related to your “piece of mail” in one place. Storing important wedding information (map, gift I purchased, whether I wrapped it, and where I stored it, because I’m notorious for forgetting gifts hidden around the house). A reminder to check with my husband on our availability to attend an event. I placed the event invitation in the folder dated 8/20. I knew my husband and I would both have our calendars and have time to discuss the event on that day. A reminder to renew memberships when I can’t do it right away. Storage for important travel information (tickets, reservations, itinerary, etc). A reminder and storage mechanism for birthdays and anniversaries and the cards I want to send out for them. Secure storage for important meeting information. Irregular to-do’s and the items I need to complete them. I love the versatility of this organization system. You can tweak it a thousand different ways to make it work for you! This post contains affiliate links for your convenience. For more information, see my policies here. As always, my favorable opinions of helpful organizing tools are 100% my own. I used files that were all the same color. Some people prefer to have a different color for the month files. And others just round up whatever files they have on hand. Make this work for you! You can use hanging files or file folders. Label 12 of the files with the months, January – December. Place the current month at the front, then continue chronologically. Once you get to December continue with January, February, etc., until you’re out of files. At the beginning of each new month, place last month’s file in the back. That should leave the current month’s folder at the front. Label the remaining files with numbers 1-31. Start with the file for the current date (for example, the 19th), then continue through the end of the month. The files for the days prior to the current date go behind the next month (September), so that you can start assigning tasks to the days at the beginning of September. Weekend Dates: If you don’t plan on checking your Tickler File on the weekends, remove any files corresponding to those days. Place those files behind the next month and just rearrange files as needed. Option: If it works better for you and your business or organizing style, you can replace the daily files with weekly ones. Instead of 31 files behind the month, you’d have 4-5 files corresponding to the weeks of that month. I found that the weekly files work better for me, because it feels less overwhelming to have one file to tackle each week than one each day. But that’s just me. As always, do what works best for you! Now that your Tickler File is set up, you’re ready to put it into action in your home office! The process of using a Tickler File is fairly simple, and it leaves room for individual adaptations depending on the type of work you do. Start by going through any items that have a due date. Place those items in the file corresponding to the due date or a couple of days earlier, in case you need some lead time. If you have items that aren’t due for several months you can place them in the folder of the month they’re due. Just make a habit of checking the month’s file on the 1st of that month. Now add any non-dated tasks that are on your to-do list or in your get-done pile. Each day, pull out the corresponding folder and process the items in it. Then, place the empty file at the back of the next month, behind the folder you processed the day before. As you get accustomed to using the Tickler File for different types of tasks, you’ll likely find new ways to use it that apply only to you and your business. For example, I have a lot of big, ongoing projects like seasonal email marketing campaigns, organization projects, and blog post research and outlines. In the front of my Tickler File I keep 5-8 empty hanging files. When I’m in the middle of these ongoing projects, I convert one of the empty hanging files to the storehouse for all of my papers, research, notes, etc., for that project. When I want to work on this project, I grab the hanging file, which includes everything I need to work on it (including a project planner; grab yours HERE), and I get to work. When it’s time to clean up, I just return everything to the hanging file and put it back in the front of my tickler box. If you plan to use your Tickler File in this way, check out this post, Tips for Setting Up a Home Office Filing System, for tips on keeping all of your papers in place, organized, and securely stowed. Especially read the Keep Items in Place and Stowing Small Items sections. I also use my Tickler Files in conjunction with my Mobile Office. During the school year I tuck the items from each week’s file (I’m using the weekly set up) into my Mobile Office, so that I can work on them while I’m waiting to pick up my kids after their activities. The idea of the Tickler File sounds great, but it won’t help you manage your workflow if you don’t create a routine for checking the daily (or weekly) and monthly files. You can pull out the following day’s file when you’re writing your to-do list for the next day. Place the file on your desk beneath your to-do list, so that you can’t help but see it. When I open my mail I keep my Tickler File close by, so that I can add a deadline and file those items immediately. You’ll develop your own routine for remembering to check your tickler files. But until it’s a solid routine, I recommend setting an alarm or two on your phone, calendar, watch, etc. You’ll likely need an external reminder for several weeks. 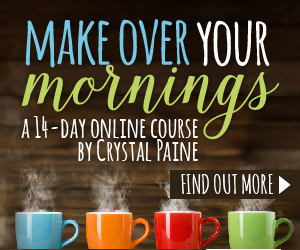 Want to learn more about awesome business routines? Check out 6 Things To Do on Sunday for the Best Work Week Ever! If you’re prone to procrastination, the Tickler File can become a way for you to put off making even more decisions. If you’ve moved a task from one daily folder to a later one more than twice, you might want to re-evaluate how meaningful it is to complete that task. This system will break down quickly if you allow your Tickler File to fill up with procrastinated tasks. And it will become a burden rather than a blessing. Now you know how to create and implement a Tickler File! 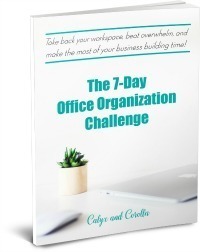 Keeping yourself, your office, and your business organized can be an ongoing struggle. But by creating and implementing a Tickler File, you can stop struggling, get and stay organized, clear the paper piles from your desk, and manage your workflow. Get organized with a Tickler File today! Make sure you pin this post, so that you can find it when you’re ready to create your tickler file! If you found today’s post helpful, you might also enjoy these posts!